If you’re one of the many JRPG fans upset that Sega gave up on proper Phantasy Star games after the Genesis, here is a game for you: Cosmic Star Heroine, a new RPG that channels all sorts of beloved classics, from Chrono Trigger to Suikoden. 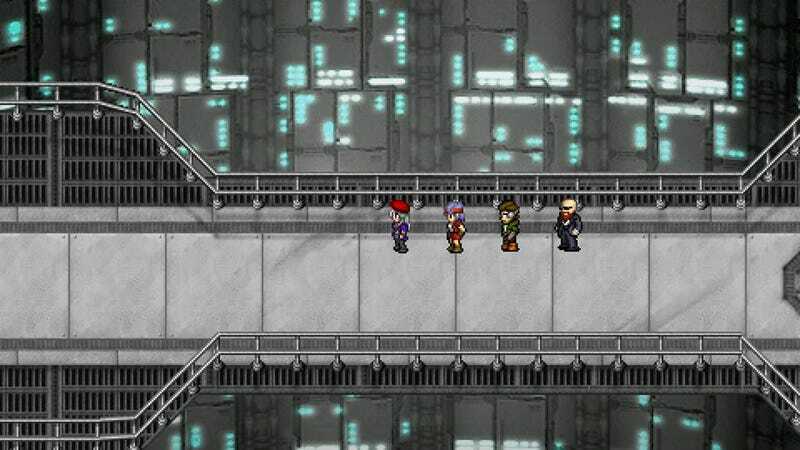 So far I’ve played three hours of Cosmic Star Heroine, which came out yesterday for PC and PS4 (with more platforms to follow). It’s a little rough—there are some weird bugs, and my game soft-locked once—but it’s charming and funny, to the point where it might actually take you away from Persona 5. It centers around a super-spy space agent named Alyssa L’Salle, who finds herself battling against a giant conspiracy and sets out to save the galaxy (as you do). And it’s been in development since mid-2013, when it was Kickstarted with an estimated release date of, uh, 2014. Cosmic Star Heroine is the product of Zeboyd Games, a development team made up of Robert Boyd and Bill Stiernberg. Their previous games include Breath of Death VII, Cthulhu Saves The World, and the final two Penny Arcade RPGs, but this might be the best yet, mostly because of the killer combat system. Much like Chrono Trigger, combat in Cosmic Star Heroine begins when you run into an enemy avatar out in the field. Your party will move into position, and then you’ll enter a turn-based battle in which you’ll have to pick commands for each character, one round at a time. Each character can attack, defend, cast spells, etc. Standard JRPG fare. But Cosmic Star Heroine has some neat twists. For starters, there are no magic points or skill points. Instead, you can use each of your characters’ skills once before it’s locked behind a gate. To use that skill again—unless it’s a “reusable” skill—you’ll have to defend. So let’s say your main character, Alyssa, starts off with the Laser and Drown skills, as well as the weaker, but reusable Bash skill. On turn one she might use Laser, then on turn two she could use Drown. But now, on turn three, she can only use Bash or defend. If she defends, all of her skills will be recharged on turn four. Adding an extra wrinkle to this system is the hyper bar, a gauge that fills up on every turn. On the turn that it’s filled, your character will go into hyper mode and do extra damage, after which the hyper bar will reset again. So let’s say Alyssa’s hyper bar takes three turns to fill, and she’s fighting an enemy that’s weak to water skills. If she uses Laser on turn one and then Drown (a water skill, obviously) on turn two, she’ll get to turn three and enter hyper mode, but she won’t be able to use Drown to optimize the amount of damage she does against that enemy, because it’ll be locked. In order to take out enemies, you’ll have to plan ahead. As you get more party members and combat gets more complicated, fighting battles start to feel like looking over a big chessboard, deciding when to use each action to do the most damage before an enemy can take you out. Do you want to waste a hyper turn healing or gamble that you can win before your party members lose all of their health? Do you want to use Alyssa’s strength buff on Chahn to do fire damage or Dave to take out those robots with electricity? On the tougher difficulty modes—I’m playing on the hard “Heroine” difficulty—this can get really elaborate, challenging, and fun. So yeah, I recommend Cosmic Star Heroine. The finicky little bugs can get annoying—for some reason on PS4, the game is ultra-sensitive when starting conversations and will continually restart dialogue after you’ve Xed out of the box—but I’m quite enjoying the game so far.